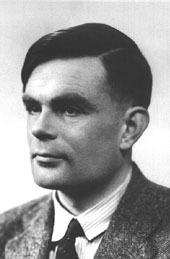 Alan Turing solved one of the most crucial mathematical problems of the modern era at the age of twenty-four, creating the theoretical basis for computation in the process. Then he became the top code-breaker in the world--when he wasn't bicycling around wearing a gas mask or running twenty miles with an alarm clock tied around his waist. If it hadn't been for the success of Turing's top-secret wartime mission, the Allies might have lost World War II. After the war, he created the field of artificial intelligence and laid down the foundations of the art and science of programming. He was notoriously disheveled, socially withdrawn, sometimes loud and abrasive, and even his friends thought that he carried nonconformity to weird extremes. At the age of forty-two, he committed suicide, hounded cruelly by the same government he helped save. 7. Können wir selbst es besser? 1. Was ist ein Computer?